At the Great White Throne Judgment, all will be resurrected and judged according to their deeds. Atonement is applied to all those whose names are found in the Lamb's Book of Life, all others are thrown into the lake of fire for all eternity. From a priestly perspective, this was the day that God would absolve or condemn the entire nation of Israel for its sins. The nation was required to present sin offerings for this occasion, and if the offering was accepted, the nation's sins would be forgiven and the High Priest would be able to enter the Holy of Holies and sit on the 'mercy seat' of the Ark of the Covenant in the presence of God. If the offering was not accepted or if the High Priest did anything wrong, the people would be under judgment, and God would smite the High Priest where he stood. It was for this reason that the High Priest would wear a rope around his waist: if anything went wrong, the people could pull his body out of the Holy of Holies. 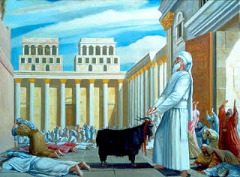 Leviticus 16 describes the way offerings were presented at this feast to atone for the sin of the people: two goats were chosen, along with a bull. Furthermore, two rams were chosen as burnt offerings—that is, worship offerings, which are different from sin offerings. The Yom Kippur sacrifice began with the sin offerings: first the bull was sacrificed, and its blood was placed on the mercy seat of the Ark of the Covenant, where God’s presence was. Then lots were cast to decide which of the goats would be sacrificed. The one the lot fell to was sacrificed as holy to the LORD and its blood was mingled with that of the bull on the mercy seat. The other goat, chosen for ‘Azazel’ (pronounced uh-zaw’-zel) was left alive, but the priest would place his bloody hands on its head and commit all the sins of the people on it. Then it was sent away out of the presence of God into the wilderness. Lastly, the two rams were sacrificed in worship as burnt offerings. An interesting tradition is that a scarlet thread was tied around the Azazel goat's neck. The scarlet thread would fall off as the goat made its way out of the camp to die; people would follow the trail of the goat until they located the scarlet thread. When the sacrifices in the Temple were accepted, the scarlet thread would turn white. The Talmud records that from the year of Jesus' death, 30 AD, until the Second Temple was destroyed in 70 AD, the scarlet thread NEVER turned white. This is because Jesus took all of the sins of the whole world upon Himself; no more sacrifice for sin was necessary as a temporary covering, and the way to God was made permanently open in the New Covenant to all who accept it. In the New Covenant, Yom Kippur takes an apocalyptic approach; at the end of all time, every person ever created from the beginning of the world to its end will be resurrected and will stand before the LORD Almighty, the Creator, King of the Universe, and ultimate Judge, to account for their deeds. This is depicted in the Book of Revelation chapter 20:11-15; Christians call this event The Great White Throne Judgment. At this time, the redemption that was purchased for us at Passover will be finally applied to those who have accepted it by faith. Those who reject God’s offer will find themselves blotted out of the Book of Life. As Judeo-Christians, we can rejoice that from the moment we accept the New Covenant as true God-worshipers, we can be confident that our names are written in the Book of Life with the permanent ink of Jesus' blood. Ok—so how do Yom Kippur and the Great White Throne Judgment match up? The bull represents Jesus, who was slain to provide mercy and to write our names in the Book of Life. The two goats, on the other hand, represent us, NOT Jesus. We have a choice whether to participate in the process of transformation from self-worship to God-worship, which involves a death to self. So, while at first it seems that the live goat got the better deal at Yom Kippur, it was actually the goat that was sacrificed who became ‘saved’. Sounds upside-down, doesn’t it? Jesus said six times in all four Gospels, “Whoever loves his life and tries to keep or save it will lose it; but whoever hates his life in this world and loses it for My sake will preserve it eternally.” (Harmony of all six statements Matt. 10:39; Matt. 16:25; Mark 8:35; Luke 9:24; Luke 17:33; John 12:25) The fact that this is recorded so often shows that Jesus said this on more than one occasion—it must be pretty important! The blood of the goat that was sacrificed was mingled with the blood of the bull. What this means is that in our death to self-worship, we share in the life of Jesus—the blood represents the life (Exodus 17:11). Many Christians believe that they will escape the judgment of Yom Kippur because of their belief in Christ—but that’s not what the text says. It says everyone will be judged according to what they have done. Judgment according to deeds is the first stage of a two-stage judgment: all people, whether Christian or not, are judged according to how our lives stack up to the nature of self-sacrifice (God-worship) or the way of self-worship. Those that are familiar with the American criminal justice system know that it also has a two-stage judicial process: a trial phase and a sentencing phase. In the trial phase, the defendant is judged by a jury and pronounced guilty or innocent by the judge. Relating to Revelation, this is where the record books are opened and each person is judged according to what he or she has done. The person is either self-sacrificial or self-worshipping. One problem: “ALL have sinned and fallen short of the glory of God”(Romans 3:23)—that is, all of us have been guilty of at least some self-worship at some time in our lives. So we are ALL declared guilty! Next, however, we move on to the second stage of judgment: sentencing. Thank God for Jesus, our sacrifice, who went before us with His blood and cleared the way on the mercy seat. He paid the punishment for any who choose Him! When our life is mingled with His life, He is able to write our name in the Book of Life, showing that the sentence for our self-worship has already been paid. Our death sentence has been commuted to Jesus’ time served! If a person’s name is not found in the Book of Life, however, he or she is an Azazel goat, and is sent away along with all self-worship into eternal judgment. As I studied this feast in depth as research for my book, I found that the word Azazel is a compound Hebrew word that has the connotation of rebelliousness, strong-willed, hardened, or toughened, and away from or against the presence of God. In the Book of Enoch, one of the Watchers also has this name, and some traditions say that the live goat (often mistakenly referred to as the scapegoat) was actually given to this archdemon. As I look at these passages however, I would interpret the live goat to represent people who have adopted the spirit of Azazel, that is, the spirit of rebellious, stiff-necked self-worship. They are sent away from the presence of God to the lake of fire, where their self-worship burns in them and eternally torments and consumes them forever and ever. This explains two seemingly puzzling sections of Scripture: one in the Tanakh, and one in the New Covenant. In Ezekiel 33:10-20, the LORD declares that if a righteous man becomes wicked, his righteousness alone will not save him; yet if a wicked man repents and becomes righteous, he will be saved. Here, the issue is about the definitions of righteousness that I laid out in my first book, The Upside-Down Kingdom basically saying that sin is determined by a self-worship nature rather than by activity; and that the activities that we consider sinful are simply by-products of this nature. Therefore, applying this logic to the Ezekiel passage above, if a person who does ‘good’ things becomes a self-worshiper (we all have), then doing ‘good works’ alone will not save us; but if a self-worshiper becomes a God-worshiper in acceptance of the New Covenant, then his/her self-worship will be annulled before the Father in the Book of Life. The things we 'lay down' as acts of God-worship based on our relationship with Jesus are what stands. All the things we did in self-worship are sent off to the lake of fire with the Devil—IF the seed of God-worship has truly been planted in our heart. When all has been judged, all that remains are the gold, silver, and gems of pure God-worship as a pleasing aroma in our completely reconciled relationship with God. Our self-sacrifice and Jesus’ self-sacrifice waft eternal as the burnt offerings of the two rams at the end of the Yom Kippur event—only now it is eternal, reciprocal self-sacrificial love between us and God—which also points to the final feast on the Levitical calendar, Sukkot. Question: Given the examination of all this, is there a way in which Judeo-Christians should observe Yom Kippur, or should we simply wait for the fulfillment at the resurrection? While good deeds will in no way ever save us, it is clear that God is producing holiness in the life of the God-worshiper. Reconciliation of ourselves to God was accomplished on the cross--there is no doubt about this, and I would never even dream to say that a person can attain salvation by what they do. We know, however, from the Scriptures that our behavior is the testimony of which nature we have received: self-worship, or God-worship. In this life, we struggle to be rid of the self-worship nature as the Holy Spirit produces God-worship in us, and this requires a a commitment on our part to deny ourselves and instead yield to the Holy Spirit. Our obedience to the Holy Spirit produces an eternal reward that we will receive at Yom Kippur; the knowledge of this should bring us to pause and cause us to contemplate whether we have yielded ourselves to the LORD or if there is anything He wants to change in us that we are holding back from the process. The fast of Yom Kippur is an excellent time for us as Judeo-Christians to ask ourselves this question. I would encourage any Christian to fast on this day for the purpose of introspection: we should thank God that our sins have been atoned for through Jesus' sacrifice; we should consider our commitment to the Holy Spirit's process of sanctification, and we should ask the LORD if there is anything in our lives that displeases Him, taking action on whatever He may bring to our minds. It is a time for solemn repentance and renewal of relationship with the LORD.